This page explains 2:1 mechanical advantage systems. In a 2:1 system, you pull with approximately half as much force as the weight of the load. Refer to the overview on raising systems to learn more about mechanical advantage systems. A key benefit of 2:1 systems is their simplicity—they only require one rope and one pulley (although 2:1 systems frequently add a COD pulley to improve the direction of pull and to add a progress capture device). Their obvious disadvantage is they don't add much mechanical advantage. Another consideration is that you have to get the pulley to the load (e.g., patient) or " piggyback" the system onto a rope. The following illustrations show 2:1 systems without and with a COD pulley. 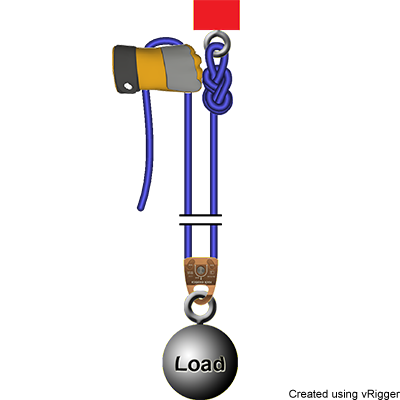 This next system retains the COD pulley, but it "piggybacks" the 2:1 system onto another rope (i.e., in this illustration, the blue 2:1 system is piggybacked onto the yellow rope). The advantage of using a piggyback system (sometimes called a "pig rig") is that the pulley doesn't need to be attached to the load (which might be a long way from the anchor). This enables rescuers to use less rope and makes it less likely that the pulley will get caught on the terrain when raising. The disadvantage of a piggyback system is a little additional complexity. Piggyback systems also need to be "reset" as described in the discussion on resetting mechanical advantage systems . It is easy to confuse the 2:1 piggyback system shown here with a 3:1 system. Both systems have the classic "Z-rig" appearance. Notice, however, that the end of the rope on 2:1 systems is attached to the anchor whereas the end of the rope on 3:1 systems is attached to the load. 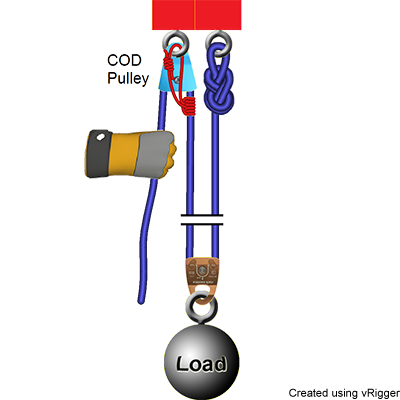 Whether the end of the rope connects to the anchor or to the load is a subtle difference between mechanical advantage systems that have an even number (e.g., 2:1, 4:1, 6:1, etc) and systems that have an odd number (e.g., 1:1, 3:1, 5:1, etc). The end of the rope is attached to the anchor on systems with an even-numbered mechanical advantage ratio. vRigger costs less than a rope.